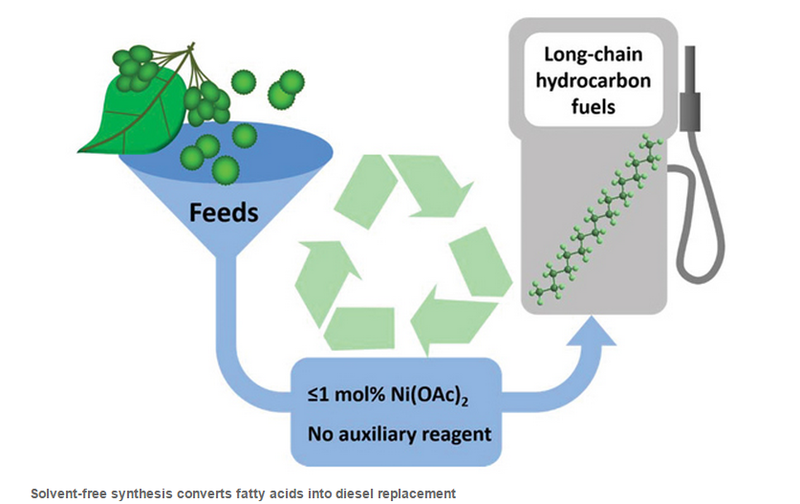 It is possible to synthesise hydrocarbon biofuel from waste fats and oils, such as cooking oils. Traditionally this process occurs with a catalyst under harsh alkaline conditions and in the presence of hydrogen. As a result, waste solvent is produced and not enough oxygen is removed for compatibility with diesel engines. In addition, with the presence of fatty acids the process does not work and the catalyst is deactivated. In recent experiments, Ding Ma (Peking University) and Ning Yan (National University of Singapore), tested a series of nickel-based salts as pre-catalysits for deoxygenating fatty acids and triglycerides and forming shorter chain hydrocarbons, without the need for a solvent or hydrogen. The nickel nanoparticles that are formed act as a catalytic species and are stabilised by the presence of fatty acids. Although these preliminary results look promising, a lot more research into the applications and commercial viability of the findings are required. You are currently browsing the archives for the Chemistry World category.